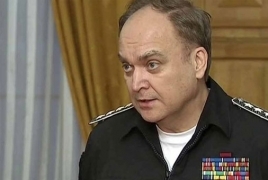 PanARMENIAN.Net - The Russian military base deployed in Armenia serves as a guarantor of stability in the Caucasus region, Russia’s Deputy Defense Minister Anatoly Antonov told reporters Tuesday, August 16. “The successful operation of the 102nd Russian military base is another indicator of the high level of allied relations,” Antonov said. According to him, "a 2016 joint work plan of Russian and Armenian Defense Ministries is being successfully implemented." "It envisages over 40 various events, of which 22 have already been realized," he added. Antonov arrived in Armenia to participate in the session of the CSTO Defense Ministers Council in Yerevan which took place on Tuesday. Defense Ministry delegations from CSTO member states - Belarus, Kazakhstan, Kyrgyzstan, Russia, Tajikistan – as well as Secretary General Nikolay Bordyuzha and Chief of Staff, Colonel-General Anatoly Sidorov participated in the session.